SOLD Belgii Novi Anglae Novae, et partis Virginae Novissima Delineatio. . . . Title: 'Belgii Novi, Angliae Novae, Et Partis Virginiae Novissima Delineatio Prostant Amstelaedami apud Petrum Schenk, et Gerardum Valk'. Printed in Amsterdam, 1694. State 3. 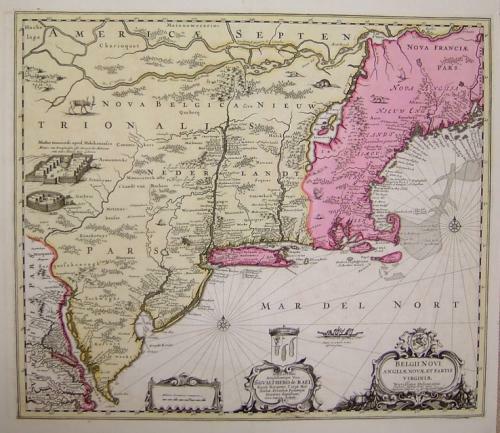 A landmark map of America from the Seventeenth Century. First laid out by Jansson in his 1651 edition of this map and followed by later cartographers for over 100 years in the Janssonius-Visscher series of maps. Compiled from numerous manuscript and printed sources, the map follows the general outline of Adriaen Block's chart of 1614 with the St. Lawrence River and Lake Champlain based on Champlain. Virtually all European settlements are depicted with several English settlements appearing for the first time on this map. Jansson shows no political bias, and virtually all known European Settlements are recorded. The map was copied by most of the other prominent cartographers of the period, with Visscher later adding a view of New Amsterdam. The map is lavishly embellished with engravings of local game and two large Indian villages, all derived from Blaeu. The general outline of the map is derived from Peter Minuit, drawn from the Adriaen Block chart of 1614. The region around Manhattan is substantially updated from earlier maps. Long Island is also in a more modern configuration. Breukelen is named amoung other early place names and Indian Villages. The Versche (Connecticut) River extends far inland. Many early English Settlements appear here for the first time, including Springfield (Mr. Pinsers), Voynser (Windsor), Herfort (Hartford) and Weeters Velt (Weathersfield), Stamfort, Nieuhaven and Milfort are shown. Richly illustrated with cartouches, forts, animals. This is the third state with the added dedication to Gualthero de Raet with his coat of arms and the imprint of Valk and Schenk. No text on verso.